Joe has no idea who reported him. It’s difficult to imagine anyone in town doing that. More than likely, some well-meaning visitor to the campground saw the empty kayaks floating downstream, and called 911. As everyone in town knows (who has not been comatose, away all summer, or boycotting Facebook) that incident led the Boy Scouts of America to suspend our long-time Scoutmaster, Joe Brandl. The BSA has now denied his appeal. It was a routine outing last May, a typical outdoors training exercise for the troop that Joe headed for many years. The Wind River was predictably high with the late-spring runoff of snowmelt, and some of the boys were tipped from their kayaks. None of the scouts was hurt or even (in the other sense of the word) upset. This had happened before, and was hardly unexpected. Thanks to Joe’s guidance, they already knew what to do. In fact, they probably saw it as an ordinary part of the training. But the Sheriff and the volunteer fire department showed up, and somehow the BSA got wind of it. Although the local Sheriff closed the case without further action, the Wyoming State Council decided that Joe’s outdoor activities were “reckless and endangering.” He was suspended with a threat of dismissal, which has now been carried out. Nearly everyone here likes Joe Brandl, who exemplifies the characteristics most of us admire and hope to emulate: Courage, good sense, good humor, open-mindedness, honesty, selflessness, an industrious temperament and an independent spirit. He delights us with his imaginative Facebook page, updated at least daily. Sometimes he dresses up and poses as a Mountain Man, a homesteader, or an English gentleman. Next he shows us the buffalo moccasins or rawhide neckties he is making (he’s a tanner by trade), or he posts a quote by a philosopher with an image of the mountains. It’s worth joining Facebook if your only friend there is Joe Brandl. Joe has been sharing his outdoor survival skills for many years, with everyone, in every medium: Public workshops and treks for all ages, article series in the local newspaper, posts on Facebook, and of course his tireless efforts with his Boy Scouts. His appearance a few years ago on the reality show Naked and Afraid was just a lark. His “life devotion,” Joe wrote recently on Facebook, has been his work with the scouts. Many comments mentioned the fact that neither party named as signators to the letter (Brad Bodoh, CEO of the Greater Wyoming Council, and Shane Calendine, regional director of BSA’s Western Region) actually signed it. This was seen as demonstrating a lack of courage or conviction. Joe says that the Boy Scouts in Dubois continue strong, and that parents have stepped forward to help. Forbidden himself to volunteer as a Boy Scout leader, to wear their uniform, or even to take part in troop meetings, Joe continues to hold well-attended meetings in which he trains boys and young men in survival and independence, according to the tenets of Robert Baden-Powell. Three days ago he was teaching them to make snowshoes from willow branches. “I am not shocked by their decision, but just baffled by it,” Joe wrote on Facebook after sending his futile letter of appeal to the BSA. Baffling, indeed. In an era when priests and public officials are vilified for the most distressing of indiscretions, our Scout leader has been stripped of his rank for the offense of teaching independence and survival skills to young men who enjoy, and many of whom hope to find a way to continue living in, this wilderness. For whatever it’s worth, Brad Bodoh lives in Casper and Shane Calendine lives in Las Vegas, Nevada. Neither accepted the opportunity to comment on this blog before posting. The action they chose is another testimony, and this a very sad one, to the fact that Dubois is unique, challenging, close-knit, wonderful, and extremely difficult to describe or to understand from a distance. In order to get it, you have to be here for a while. Not very many have that privilege. You can see new entries of LivingDubois every week if you sign up at the top of the right column at www.livingdubois.com. The sight of tanks rolling down the main street of Dubois would be jarring if we did not know the context: the Independence Day parade. Every July, we have been seeing just a few of the tanks, trucks, and ambulances brought out for the day by a local landowner, Dan Starks, an engineer who is fascinated by the machinery and its history. Starks has about 250 US military vehicles dating back to World War II, the largest private collection in the country and perhaps the world. When he decided to open most of it to public view in a new museum just down the river, this has understandably provoked some conversation. What effect will this have on our town? How will this fit with our shared image of Dubois: Remote, quiet, rustic, peaceful? 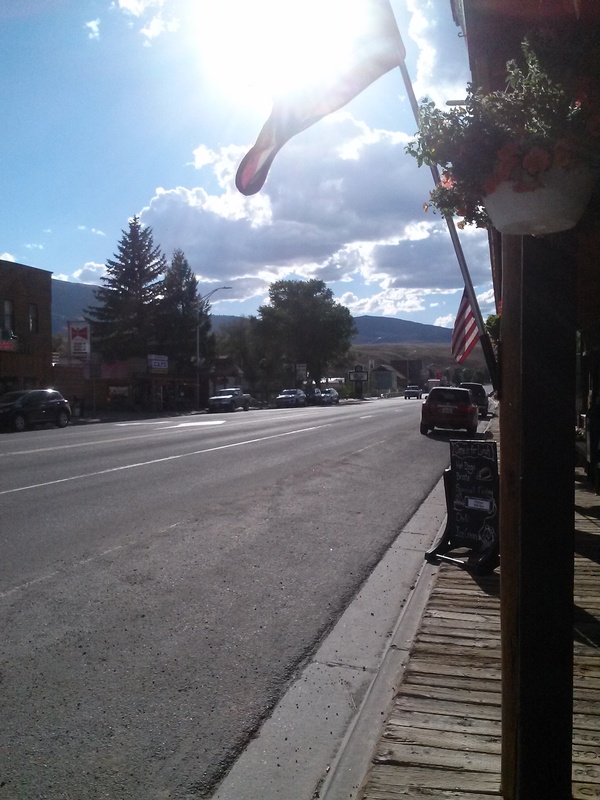 Will it be the long-sought “draw” that lures people to stop overnight n Dubois on their way to Yellowstone? Will this all overwhelm us, as the Total Eclipse did last year (but only for a few days)? Whatever our questions, the National Museum of Military Vehicles is rising rapidly from its foundations–all 144,000 square feet of it (so far), to exhibit 107 vehicles from World War II, with a second building coming later to house about another 80 post-WWII vehicles, as well as two additional exhibits, a library, a theater, and two classrooms. The first building should be completed next May, and some of the exhibits should be more or less in place for a “soft launch” next September. After a winter of finalizing the exhibits and training staff, a grand opening is scheduled for May 2020. Starks said he started his work life harvesting beans and working in warehouses, and eventually turned a bankrupt medical device company into a Fortune 500 firm with $6 billion in annual sales in 130 countries. He has bought up a great deal of property in the area, and reportedly contributed large amounts anonymously for various charitable causes here. Gradually, Starks began bringing his collection of tanks, trucks, ambulances, and other military vehicles to his property near town. Some visiting friends who saw them urged Starks to share the huge collection with others, and eventually he decided to do so. Starks was speaking at a public forum on May 31, co-chaired by Dubois resident and Wyoming state Congressman Tim Salazar, a member of the legislative task force created to study whether the state could or should be involved in the private enterprise. Earlier that day, Starks had welcomed the public to his property, to view at least part of the collection. Speaking in a rapid-fire monologue, and naming the vehicles by model number, he spoke about them with some passion. He told how the rivets in the earliest tanks could pop inward under fire, turning them into deadly weapons that doomed their operators. He described the progress in tank technology throughout World War II—the lower profile, the increases in the armor, improvements in welding and casting, engines and transmissions and weaponry, and what this all meant to protecting the troops and to victory. I asked about the truck standing next to it, and Starks described why a new delivery/artillery hybrid was needed in the Vietnam, where it was easy to lob a grenade at a supply vehicle. An onlooker spoke up to say that he had actually used a truck like that in ‘Nam. “You see, that’s what I’m hoping for,” Starks remarked. He wants to tell the stories around the vehicles, and to prompt memories from veterans who see the displays. During the public forum that afternoon, she raised her concern that the museum would glorify war in a landscape of quiet and refuge. Starks (who is not himself a veteran) replied quietly and respectfully, saying that he would like to speak more with her about that in private. A politician at the dais remarked that, done well, the stories behind the machinery could bring to life the true costs of war–and might therefore help to deter it. The new curator of the museum, Doug Cubbison, who comes here directly from 5 years at the Veterans Museum in Casper, has been working quietly in town since last August to begin the massive effort of creating and staffing a huge and unique institution in one of the most remote towns in the country. Already, they have made some firm decisions about what they will not do, Cubbison told me. They will not open a restaurant or lodging as part of the museum complex, to avoid to avoid competing with the businesses in town, and they plan to coordinate with the Chamber of Commerce to direct visitors to services in Dubois. The most refreshment offered in the museum will be beverages such as water and soft drinks. The gift shop will sell only books and other objects related to military vehicles and their history, to avoid competing with other shops in town.